This page covers the estimated fuel economy (mpg) and CO2 emissions for the life of the vehicle. A life time comparison of fuel use and CO2 emissions is made between our last (typical) RV and this new, more efficient camper van conversion. Fuel economy and carbon emissions are important to us. We chose the smallest PM (136 WB) that we thought would be OK for camping, and we worked on keeping the weight of the conversion down. The only exterior drag producers are MaxxFan and running board. Full up weight on the road for trip, about 6500 lbs. We drove with fuel economy in mind — went 60 to 65 mph on freeways, and 50 to 65 mph on two lanes with average near 60 mph. I kept track of mpg (miles per gallon) both with computer and using actual gallons from fill ups. The computer reported anywhere from 0.1 to to 1.2 greater mpg than actual calculations — weighted average was 0.56 mpg higher. Full trip was 2065 miles from Bozeman, MT down through south Utah canyon country and back. Grand average for 2065 miles was 20.2 mpg on computer and 19.6 mpg on actual calculations. These are actual mpg based on fillups. Not sure I believe the poorer mpg going slower on paved two lane roads — have always done quite well on mpg for this kind of driving on other vehicles. This was all on winter formulated gas. FuelEconomy.gov says the winter formulation cuts mpg by about 3.5%, which would raise the numbers above by about 0.7 mpg. We only had 430 miles on odometer at start of trip, so there may be some breakin still happening, and that may raise mpg a bit (or not?). This is nearly twice the the mpg we got on our past RVs, which were not huge ones by any means, so we are feeling pretty good about the PM. Would love to someday have an RV that gets 30+ mpg, but this is good for now. The main objectives of this project was to build an RV that uses much less gasoline, saved on fuel costs, and significantly reduced carbon emissions — so, how did it do? This section estimates the fuel savings between our new ProMaster conversion RV and our old RVs (which I’d say were pretty typical of what’s out there on the road now). New RV gasoline use over life = (150,000 mi) / 20 mpg = 7500 gallons, or $30,000 at $4 per gallon. Our last RV got about 10 mpg and its pretty typical of what’s out on the highways now — some are better, some worse, and some much worse. Its interesting (maybe) that the cost of fuel over the life of the vehicle is roughly the same as what the initial cost of the vehicle was. These may not match your situation, but easy enough to plug in your own numbers. Burning a gallon of gasoline produces 19.64 lbs of CO2. So, compared to a 10 mpg RV, our new 20 mpg RV will save about $30,000 in fuel costs and about 74 tons in CO2 emissions over its life. The other good features include smaller size, easier drive and more maneuverable, easier to park, and less of the big hulk feeling. On the negative side, there is somewhat less space inside and no shower. Maybe some day it will be possible to do a 30 or even 40 mpg RV and that will be great, but, for now we are happy with our 20 mpg effort. Another interesting variation would be to use the diesel version of the ProMaster (or Transit or Sprinter) as the base vehicle. This would probably get you up to around 24 mpg and would use about 1300 gallons less than the gasoline model over 150,000 miles. Right now, the higher cost per gallon of diesel pretty well washes out with the better mpg. There would also be some CO2 emission saving, but not as much as you might think in that burning a gallon of diesel produces 22.4 lbs of CO2 (about 14% more than gasoline). The CO2 emissions for 150K miles would be about 70 tons (vs 73.7 tons for the gasoline model). Diesel would also allow a biofuel mix to be used, which would result if further CO2 savings. The life of the diesel might also be greater, which is a good thing for both the pocket book and manufacturing related emissions. 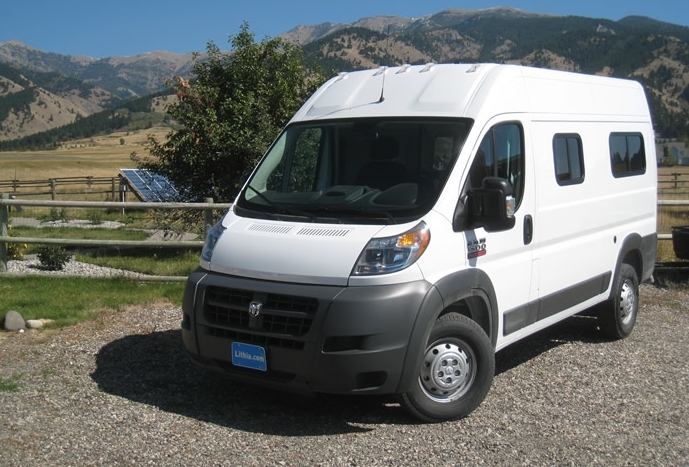 Other factors for us are that when we bought the diesel ProMaster was not yet available and it was going to be an about $4000 option when it did become available. We need that engine in the states! 37 mpg would be magical. I’d like to know how it would do under the EPA mpg testing, but its got to be a whole lot better than the 20 mpg I get on a good day.